On March 31st, 1968, The Reverend Dr. Martin Luther King, Jr., delivered an address at the National Cathedral. Four days later, this modern-day prophet was cut down in cold blood. I am not perfect. No one is. Guided by God’s mitzvot, those Divine invitations for connectedness that I mentioned last week, I try to live a life of good will. I am, I’d like to believe, a good person. Which is why I stand here today before you, before myself, before the Holy One, Blessed be God, and acknowledge my prejudice and my privilege. It is time to get uncomfortable. Today marks the 98th anniversary of the Elaine massacre. If you are unfamiliar with this race riot that occurred in Elaine, AR in 1919, I suspect you are not alone. Though historians consider it to be one of the deadliest racial conflicts in the United States, I confess that I knew nothing of the three-day carnage until this year’s March for Racial Justice was scheduled specifically for today in memory of the hundreds of African-Americans who died or were imprisoned during the riots. Over the past year, race issues have moved to the forefront of public discourse and to the forefront of my conscience. The events of the past year have awakened me to the reality that the America I thought I knew is not the one I’m actually living in. The events of the past year have got me woke. And all around me, I see the façade of our “freedom for all” country crumbling before my very eyes. I am uncomfortable every day. I am uncomfortable in the way Coach Pop described as I realize that so much of the history that ’ve been taught has been one dimensional. One of my professors in rabbinical school, Rabbi Dr. Martin Cohen, was always quick to remind us that history is written by the winners. Perhaps that explains the absence of the Middle Passage, the Trail of Tears, and the Great Migration in my high school text books. Or the lack of attention given to the critical role played by African-Americans in the evelopment of Modern American music in my college music history course. Since January, I have been devouring documentaries and books as though I was suffering from an unquenchable thirst, determined to fill in the gaps of my education. Through newly-opened eyes, now seeing that the plantations of my once favourite film, Gone With The Wind, were part and parcel of what culinary historian, Michael W. Twitty, calls “a labor camp for exiled risoners of war and victims of kidnapping .” Through newly-opened eyes,now seeing that while freeing the slaves and prohibiting slavery, the Thirteenth Amendment to the Constitution also allowed for a forced labour program through the incarceration of poor freedmen in a convict leasing program. Ever since I was a teen, I felt uneasy when asked to check “the race box.” I knew that to the outsider, I certainly present as white. But I wasn’t white the same way the white kids in my class were white. With ties to the Colonies, their ancestors were living here in the New World at the same time that mine were barely keeping one step ahead of the Cossacks. So I would check “other.” And if given space, I would write: Ashkenazic Jewish. I wanted my identity to be acknowledged. I wanted whoever was collecting the demographic information to know that my experience wasn’t like the average white experience. It’s only now that I wonder if my discomfort was that I didn’t want to be held accountable for the institutional oppression committed against Blacks. I consider myself a highly-educated person. I was reared by highly-educated parents in a home overflowing with books. I attended a very good public high school and a private, liberal arts college. I had the luxury of devoting five years to graduate study, and have been given every possible advantage. I was a good student, often seeking out additional information to further my own education. Yet why was it that I had never heard of Medger Evers until “The Ghosts of Mississippi,” the 1996 Hollywood treatment of Evers’ story? Or of Emmett Till, until somewhat recently when I read his name in connection with other violent acts against blacks? Or Nat Turner? Or Ida B. Wells? Or…? While the names of Frederick Douglass, Malcolm X, Martin Luther King, Jr., Harriett Tubman, and Sojourner Truth were familiar, their stories and writings were certainly not included in the AP United States History and AP American Literature curricula of my “very fine high school.” Nor W.E.B. DuBois. Or James Baldwin. Or Octavia Butler. Or Zora Neale Hurston. Or Phillis Wheatley. Why were they, and other thought leaders of colour, not included alongside Thoreau, Whitman, Hawthorne, Emerson, Dickinson, Austen, and Wharton? Can you imagine being a student of colour and never reading words that reflect your experience? Your history? Your identity? While education is meant to expose students to circumstances and ideas beyond their experience, shouldn’t that apply to white students as well? Why must our literary canon be limited by race? Why weren’t we taught about the significant contributions of African-Americans and other people of colour to this country outside of Black History Month? I am way more than uncomfortable; I am embarrassed. And I am ashamed. Ashamed that I never thought to ask. Ashamed that I never pushed back. Yes, hindsight provides clarity. Perhaps it is unfair of me, the self of my present. to condemn me, the self of my past. In college, I participated in an alternative, diversity-awareness theatre troupe. In one of the vignettes, Sohyun, who is Korean, addressed the issue of being racially colour-blind. “You tell me that when you look at me, you don’t see race. But that’s so weird. Because when I look in the mirror, I see an Asian staring back at me.” Her monologue continued to explain how the well-intentioned attempt to see everyone as the same delegitimized her cultural journey and eroded her Korean identity. We aren’t supposed to look the same. Believe the same. Think the same. Humans were created in the Unending, Unlimited, Diversely-United, Divine Image. God intended for us to be different. And to recognize and embrace, not merely tolerate, those who are different from us. This is not the part where I encourage you to find a black friend. Or take a black friend to lunch. Or make a few phone calls. I’m talking about something much more radical. I am talking about educating ourselves. I’m talking about reading books and articles and essays by Black thought leaders whose ideas might make us viscerally uncomfortable. I’m talking about viewing films and documentaries that push us way outside our safe space and forcing us to confront what author and theologian, Jim Wallis, calls “America’s Original Sin.” Racism. of those whose journeys have been marked with abduction, enslavement, lynching, and mass incarceration all because of their skin. I’m talking about engaging in the social landscape of our nation in order to change the course of our history from one which has systematically pushed down those with a darker skin colour. The fact that our ancestors weren’t even here yet and were not participants in this ugly past does not absolve us from dismantling a system intended to subjugate others. Here’s the really uncomfortable part: acknowledge the privilege. 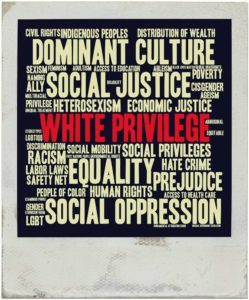 We have to acknowledge our privilege. We have to acknowledge it, says Marie Bigham, founder of ACCEPT: Admissions Community Cultivating Equity & Peace Today, “even though [we] too have experienced oppression and harm.” It will in no way diminish our Jewish experience, our losses, our pain. And then, we must seek out opportunities to make a significant impact in our wider community. We must reclaim our inheritance of the prophetic tradition: “To be the eyes of the vision and the voice for those who cannot speak ”. Isaiah, Jeremiah, Micah, Rabbi David Einhorn, Rabbi Abraham Joshua Heschel, Rabbi Joachim Prinz, and Kivie Kaplan. We were once those prophets. We sat at the lunch counters. We accompanied the Freedom Riders. We marched with Martin. We can no longer rest on the close relationships of the past because too much time and too many hateful words have eroded the bonds we once shared. We must begin anew. Rebuild those relationships. It’s not enough to simply call out injustice. Our Tradition demands that we fix it. We have to be woke up. We have to be shook up. And then we have to show up. We have to show up for that act of conscience. For the sins we have committed through conscious and unconscious racial bias. For the sins we have committed through hardening our hearts to the need for change. For the sins we have committed by colluding with racism both openly and secretly. For the sins we have committed through uttering racist words and acts of racial micro-aggression. And for the sins we have committed through confessing our commitments to ending racism insincerely. forgive us, pardon us, and grant us atonement. For the sins of racism we have committed through haughty demeanor and proud looks. For the sins of racism we have committed through the glances of our eyes and through passing judgement. For the sins of racism that we have committed through baseless hatred. For the sins of racism that we have committed through turning a blind-eye to pain and suffering around us. For the sins of racism that we have committed by not seeing racism as an evil among us. For the sins of racism that we have committed by not committing to end it. I have pardoned in response to your plea . I’m sorry but I respectfully disagree. You insinuate that that we have something to feel guilty about by the mere fact that we can “pass” as White Gentile, just because we are white. And because of that we have sinned and need to actually say am al chet? The moment any Jew says they are a Jew and lives in a Jew in today’s society they immediately separate themselves from the rest of White Gentile society. We are different and viewed differently. One just has to look at how the ultra-right and ultra-left view us to realize that. I do agree that we should expand our vision, read more and be more conscious and educated about the contributions of of African Americans. But asking for forgiveness for the wrongs of the past that White Gentile American Society created, I’m sorry I disagree. If we are to truly work towards creating a society in which the ideals of “We hold these truth to be self evident that man was created equal.” Them we have to lift everyone up. Art of it can’t be casting us down. Thank you for the article, look forward to reading more. I’m sorry, but I am not required to ask for the forgiveness of someone else’s sins, EVER. I will not apologize for being white. I will not admit that I am privileged. Nothing was handed to me simply because I am white. Matter of fact my whiteness has kept me and people in my family from scholarships, promotions, jobs, welfare aid, etc., because we checked the “white” box on applications. I too am paying for the sins of our forefathers. I believe that years ago America got it wrong, but I had nothing to do with it simply because of the color of my skin. As a young child I watched “Roots” and my heart burned with anger at what those white men did to black men. I have hated racism from childhood. My parents taught us that all men/women are created equal. I have empathy, but I will not go down this slippery slope and get caught up in this new form of racism. If I want to wear corn rows in my hair, I see it as affirming the culture of the African American. It is not micro-aggression. This is ridiculous! I have friends of all races, and none of them hold me accountable for the sins of our forefathers. Again, I’m sorry, but this is wrong.